Valletta owes its existence to the Knights of St John, who planned the city as a refuge to care for injured soldiers and pilgrims during the Crusades in the 16th century. Until the arrival of the Knights, Mount Sceberras, on which Valletta stands, lying between two natural harbours, was an arid tongue of land. No building stood on its bare rocks except for a small watch tower, called St Elmo, to be found at its extreme end. Grand Master La Valette, the gallant hero of the Great Siege of 1565, soon realised that if the Order was to maintain its hold on Malta, it had to provide adequate defences. Therefore, he drew up a plan for a new fortified city on the Sceberras peninsula. Pope Pius V and Philip II of Spain showed interest in the project. They both promised financial aid and the Pope lent the Knights the services of Francesco Laparelli, a military engineer, who drew up the necessary plans for the new city and its defences. Work started in earnest in March 1566 - first on the bastions and, soon after, on the more important buildings. The new city was to be called Valletta in honour of La Valette. The Grand Master didn’t live to see its completion and he died in 1568. His successor, Pietro del Monte continued with the work at the same pace. By 1571, the Knights transferred their quarters from Vittoriosa (Birgu) to their new capital. Architect Laparelli left Malta in 1570. He was replaced by his assistant Gerolamo Cassar, who had spent some months in Rome, where he had observed the new style of buildings in the Italian city. Cassar designed and supervised most of the early buildings, including the Sacra Infermeria, St John's Church, the Magisterial Palace and the seven Auberges, or Inns of Residence of the Knights. 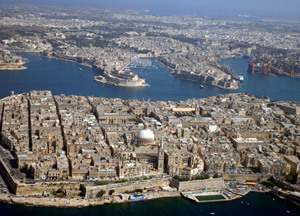 By the 16th century, Valletta had grown into a sizeable city. People from all parts of the island flocked to live within its safe fortifications especially as Mdina, until then Malta's capital, lost much of its lure. In the ensuing years, the austere mannerist style of Cassar's structures gave way to the more lavish palaces and churches with graceful facades and rich sculptural motifs. The new city, with its strong bastions and deep moats, became a bulwark of great strategic importance. 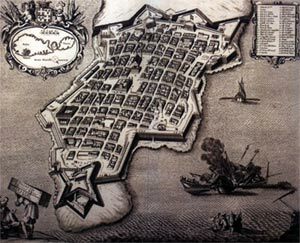 Valletta’s street plan is unique and planned with its defence in mind. Based on a more or less uniform grid, some of the streets fall steeply as you get closer to the tip of the peninsula. The stairs in some of the streets do not conform to normal dimensions since they were constructed in a way so as to allow knights in heavy armour to be able to climb the steps. Fast forward a few centuries and the city built by gentlemen for gentlemen came under another siege; this time in the shape of World War II which brought havoc to Malta. Valletta was badly battered by the bombing, but the city withstood the terrible blow and, within a few years, it rose again. The scars of the war are still visible till this day at the site previously occupied by the former Royal Opera House in the heart of the city, a wound that has left Malta’s MPs divided these past 60 years over what should replace it. During the post-war years, Valletta lost many of its citizens who moved out to more modern houses in other localities and its population dwindled to 9,000 inhabitants. However, in the last few years many individuals with a flair for unique architecture are trickling back into the city and investing in old properties. Valletta, the smallest capital of the European Union, is now the island’s major commercial and financial centre and is visited daily by throngs of tourists eager to experience the city’s rich history.